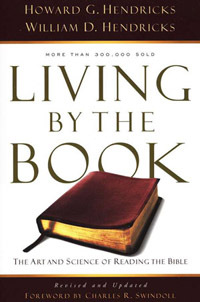 Living By The Book Hendricks looks at how to study the Bible for yourself. Howard G. Hendricks suggests that there are three processes you need to keep in mind when it comes to personal Bible study. Living By The Book by Howard and William Hendricks is like no other book when it comes to learning the processes of personal Bible Study. Church Swindoll said, "The teaching of Howard Hendricks on how to study the Bible is beyond great! How do I know? During my days in seminary, I drank in each word as I absorbed every session he taught, which changed my life! Not a week passes without my using some technique or principle that I learned from this gifted man." Living By The Book by Howard and William Hendricks is one book that you need to consider when it comes to learning how to study the Bible for yourself. Mundane or motivational? Lackluster or lively? Redundant or reviving? What words would describe your personal Buble study? Be honest. If your're like many people, you have probably felt at one time or antoher a twinge of guilt about not getting full enjoyment out of personal Bible study time. What is their secret? Howard Hendricks knows that "secret" which is really no secret at all. It is simply a case of practicing effective Bible study methods. But to practice them you must know them. And that is where Howard and William Hendricks can enlighten you and show you the setps to living by the Book. Howard Hendricks begins his book by asking: Why Study The Bible? After all, if you are going to invest your precious time into studying the Bible, you need to know what are the benefits, what's in it for you and what difference will it make in your life? When you invest in personal Bible study, Hendricks suggests three benefits: spiritual growth, spiritual maturity and spiritual effectiveness. Living By The Book will help you recieve these benefits by revealing to you the three steps or processes essential to personal Bible study. Begin with obersvation. Observation involves asking and answering the question: "What Do I See?" Observation is the key to interpretation. You need to become a biblical detective. A biblical detective looks for clue to help in the process of understanding what the text of Scripture is saying. A biblical detective looks for crucial terms, grammar, literary structures and forms and the context in which the text was written. For example, Peter asked his readers to always be ready to give a defense to everyone who askes you a reason for the hope that is in you (1 Peter 3:15b). The setting here is that of persecution. These people who have been persecuted needed to be ready to give a reason for their faith. Understanding the setting in which this verse was written adds greater meaning." The aim of observation is to collect information and clues that will help you understand the text that you are studying. Interpretation is the next step in personal Bible study. Once you have collected all the information and clues, you need to put it all together so that you can discover the meaning of the text of Scripture you are studying. Interpretation asks and answers, "What Does It Mean?" Observation and interpretation go together. You gather information (observation), you put it together (interpretation). Observation + Interpretation = Understanding. To appreciate these steps in greater detail, you may want to purchase this little book called Living By The Book by Howard and William Hendricks. Application is the step where you ask and answer: What did this mean for the original hearers and what does this mean for hearers today? You understand Scripture for a reason and that is to obey it and live it out in your Christian journey. King David said, "Give me understanding, and I will keep your law and obey it with all of my heart" (Pslam 119:34). Personal Bible study should lead to a changed life - a life that is devoted to God. How To Study The Bible For Yourself: How To Study The Bible For Yourself looks at the processes behind personal Bible study so that you can study the Bible more effectively.